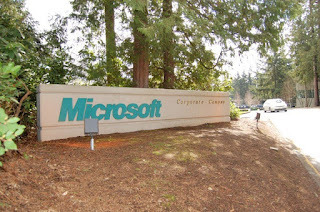 Last March 2007, I went to Seattle and Redmond, Washington to attend the Microsoft MVP Summit. The event was a global gathering of MVP awardees where to connect them with other MVPs, Microsoft executives and different product groups. It was also my first time to go to the US. I went back to Seattle this year for the 2008 Microsoft MVP Summit but I'll blog about that trip in the coming days. For now, I'll be sharing my first experience in Seattle. I arrived in the US via San Francisco with a connecting flight to Seattle. Our plane landed a few minutes past midnight in Seattle-Tacoma International Airport. It was raining hard and it was a cold night, about 0 to -2 degrees celsius. There were no taxi cabs in sight and airport taxi desks were already closed, so I decided to take the public transportation of Metro Transit. Good thing I printed out information like what bus number I should take. Public transportation system is well planned in Seattle. Metro Transit's website have a feature where you can just specify where you will be coming from, where you plan to go and about what time you plan to depart and the website will automatically suggest different iterinaries for you, including which bus number to take including what time it departs, where to take bus transfers (if applicable) and estimate the time of your arrival. I had to wait for about 15 minutes though, alone in the bus stop and wondering if what I'm doing was right, in a cold and rainy night. Minutes later, a man asked me if that was the bus stop and I'm happy to know that like me, he was also there for the summit. He had a late night plane arrival, and was also staying in my hotel. He came from Germany and was already tired during that time because of the long travel. Both of us are exhausted and and would like to see a bed. A few minutes after, a bus pulled up and we happily boarded in with our luggage. Good thing the bus wasn't full. Taking the bus is very cheap, for a mere $1.25 and about 40-45 minutes travel, we were dropped off a couple of blocks away from our hotel. So this is where we were dropped off. A few blocks from the Pike Place Market and right in front of Westlake Center. So we hurried to our hotel (it was still drizzling), checked-in and bade goodnight. I went straight to my room. After settling, I was awed by the view that greeted me when I raised the curtains. I always ask for available high floor rooms when I check into hotels. I think I was in 44th floor. It was already past 1AM, I'm tired but I'm having jetlag bigtime. Also I can't sleep well because my mom was still confined in the hospital when I left. I tried to call her but it seems she can't hear me so we instead exchanged text messages until I felt sleepy. In the morning, this is the view that greeted me. Even though I still feel sleepy, I had to get up and be ready because I signed up for a city and cruise tour. I also have to walk all the way to Sheraton Hotel, where I have no idea where, to be picked up. On the way while walking, I passed by Westlake Center and am very happy to see that there's a mall and a choice of food establishments just across our hotel. On the tour, we passed by a lot of places, including the historic King Street Train Station. We also passed Chinatown which I found so-so and not very Chinese. We drove by Qwest Field, a football and soccer field and home of NFL's Seattle Seahawks. Right beside Qwest Field is Safeco Field, a baseball park and home of MLB's Seattle Mariners. Going around the city, I saw a lot of cargo boxes and cranes in shipyards, trains pulling cargos of different sizes and even cargo trucks. The city must be a major port for the shipping industry. We also passed by a few houses and neighborhoods. A lot of houses exhibits Victorian style and I think they really looked nice. We also passed by Aiki Beach. Contrary to my notion of a "beach" here in the Philippines, it seems not a lot of people go here for bathing or swimming. There's a beautiful park though to stroll and hangout. Located in the park is a marker monument that states it is the "Birthplace of Seattle". We also passed by Fishermen's Terminal although we didn't went down because it was raining. The tour group instead went to a glass-blowing factory. I was amazed with the beauty of the artwork and how they crafted these art from heating, to shaping, coloring, etc. We also passed by Seattle Center, where Key Arena (home of NBA's Seattle SuperSonics), Space Needle, Experience Music Project, Science Fiction Museum, and other attractions are located. I was told the center was developed for Century 21 Exposition. Most notable and famous attraction here is the Space Needle. This ended our half-day city tour, we were dropped off in a pier of Argosy Cruises. This is the starting point of the Locks Cruise. During the cruise, we've passed by a lot of things including houseboats. I find houseboats amusing. The first houseboat picture is the one featured in the movie Sleepless in Seattle. A beautiful bridge also caught my eye and I took this shot. Later did I know that the bridge, named George Washington Memorial Bridge, also called Aurora Bridge, is a famous bridge in town for suicides. A highlight of the Locks Cruise is the passing by of the ship in Hiram M. Chittenden Locks. This is where Lake Union and Puget Sound water bodies meet. There is some sort of a "buffer zone" where water is either filled up or released to level the ship with the water, depending on which direction the ship is going. The skyline of Seattle is beautiful to look at from afar. After the cruise, I immediately went to downtown Seattle for the on-site registration of our summit in Washington State Trade & Convention Center. For shopaholics, Seattle has lots of signature shops to visit, and it can burn holes in your pockets. After registration, I immediately went back to my hotel because I already felt so sleepy due to jetlag and lack of sleep the day before. I only rested for a few hours though because I need to attend the welcome dinner later that night. Again, I can't help but be amazed with the view in front of my bed. Most parts of the summit is under non-disclosure agreement, but I wanted to share this thing that I find a bit interesting - a stackup of DSLR cameras! I'm happy to say I took part in this experimental exercise. Going around Seattle during my free time, I passed by Nordstrom where they have a Walk of Fame. I took a shot of these footprints of Microsoft founders Paul Allen and Bill Gates. This is how Westin Seattle looks like. It's a high-rise twin tower hotel and it look stunning. I also passed by Pike Place Market to see the famous fish throwing and catching. I also went to see the fresh produce vendors are selling. For a couple of days, sessions were hosted by our respective competency product groups, held in Microsoft campus. Because breakfast was served in the campus, we have to wake up early and take a shuttle bus for a 30-45 minute ride. I took a shot of this sunrise on the way. One thing to take note. When visiting Seattle, specially downtown, be ready for a hike. Some parts of the city are hilly and streets really go up and down radically. We were also taken to the Museum of Flight in Boeing Field for the attendee party. My eyes were glittering with the collection of planes and artifacts related to flying. I always toyed the idea of becoming a pilot one day and am amazed with things related to aviation. There were also rides like simulators and gravity defiers in the museum but I didn't dare take the latter. A few minutes walk from the Museum of Flight is Boeing. I wanted to go to their museum but didn't have the chance to. I also tried to go there this year but still didn't have the time. Of course, for the geeks, two days of the summit were held in Redmond and Bellevue Microsoft Campus. If you happen to pass by, don't skip visiting the company store. There are loads of interesting stuffs to buy, geeky cute useless stuffs to collect, and cheap Microsoft items to hoard. Although I wasn't really able to go around Seattle because time was short and my schedule was full and tight, I had a good time in the city. I made a promise to myself that the next time I visit the city, I will try to go around to more places, a promise that was fulfilled last April when I went back for the 2008 Summit. More pictures of my Seattle trip are available in multiply. For the Microsoft MVP Summit and Microsoft Campus pictures, please see this link. Just add me as a friend to view them.